Creeping, ivy-like perennial. Leaves scallop-edged, round to kidney-shaped; sometimes tinged with purple. 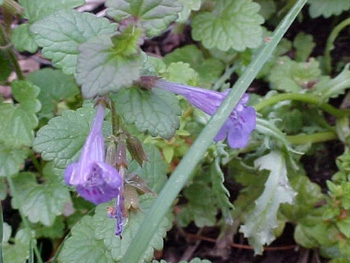 Two-lipped violet flowers, in whorls of leaf axils; March to July. Traditionally, leaf tea was used for lung ailments, sinusitis, hay fever, allergic rhinitis, asthma, jaundice, kidney ailments, as a blood purifier. Externally, a folk remedy for cancer, backaches, bruises, and piles.